A new range of pocket-size (118 x 16 x 29 mm), battery-powered, CCTV test equipment, available with (optional) leather case with belt clip. This unit will allow fine adjustment of overall focus of a CCTV camera, especially useful whenever a monitor is not available. It operates by analysing the detail in the centre of the picture and provides a 10 bar LED readout, displaying maximum output when the camera image is in sharpest focus. 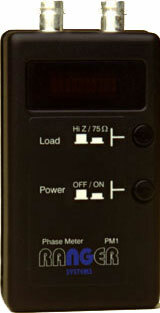 An input impedance switch provides selection between terminated (75W) and unterminated (high impedance) input.